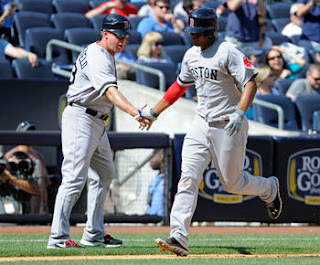 Xander Bogaerts received a ringing endorsement from Brian Butterfield (who is the 3rd base coach and infield instructor for the Red Sox), who told the Boston Herald that Bogaerts could be a great shortstop for years to come. If you are unaware, Butterfield did a lot of work with one Derek Jeter, one of the all time great shortstops. Yes, I know it is tough to admit for Sox fans (although it shouldn't be - it's the truth), but Jeter is a legend and a sure-fire Hall of Famer. So when the guy who worked with Jeter at the beginning of his career says Xander has huge potential, take it seriously. Very seriously. Butterfield has also spent time working with Bogaerts at both 3rd base and short, hitting 50-60 ground balls to him before batting practice before each game, according to the Herald. So he would know what he is talking about. It is clear Xander is special and he can go on to be a great shortstop for the Red Sox. He's already handled himself well since coming up. And he's already showed his pop with his first home run, which was a monster shot. Maybe power will turn out not to be his game, but he's shown he's got it. One full season of watching this kid will make people forget about Jose Iglesias. Maybe it won't even take that long, as we still have a couple weeks in this season, then the playoffs. That's plenty of time to make an impression. Remember, Jacoby Ellsbury had something of a coming out party in the playoff run of 2007, the World Series against the Colorado Rockies especially. All I know is I'm already sold on this kid. If he sticks around, then maybe (just maybe) he could become the next Nomar Garciaparra.